Our contemporary [Pacific Commercial Advertiser] talks very emphatically about Hawaiian made hats, worn much of late by the native women. 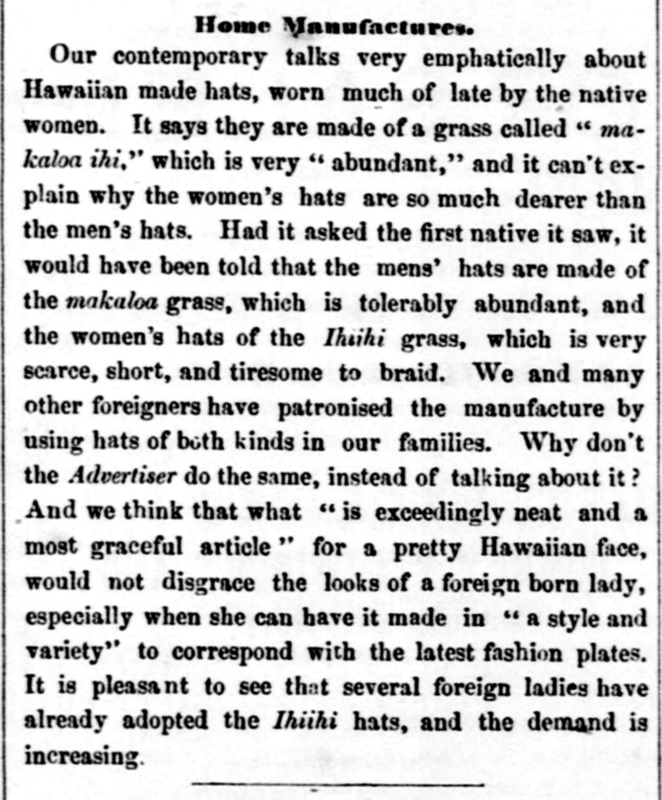 It says they are made of a grass called “makaloa ihi,” which is very “abundant,” and it can’t explain why the women’s hats are so much dearer than the men’s hats. Had it asked the first native it saw, it would have been told that the mens’ hats are made of the makaloa grass, which is tolerably abundant, and the women’s hats of the Ihiihi grass, which is very scarce, short, and tiresome to braid. We and many other foreigners have patronised the manufacture by using hats of both kinds in our families. Why don’t the Advertiser do the same, instead of talking about it? And we think that what “is exceedingly neat and a most graceful article” for a pretty Hawaiian face, would not disgrace the looks of a foreign born lady, especially when she can have it made in “a style and variety” to correspond with the latest fashion plates. It is pleasant to see that several foreign ladies have already adopted the Ihiihi hats, and the demand is increasing. The Polynesian, Volume XVIII, Number 31, Page 2. November 30, 1861. 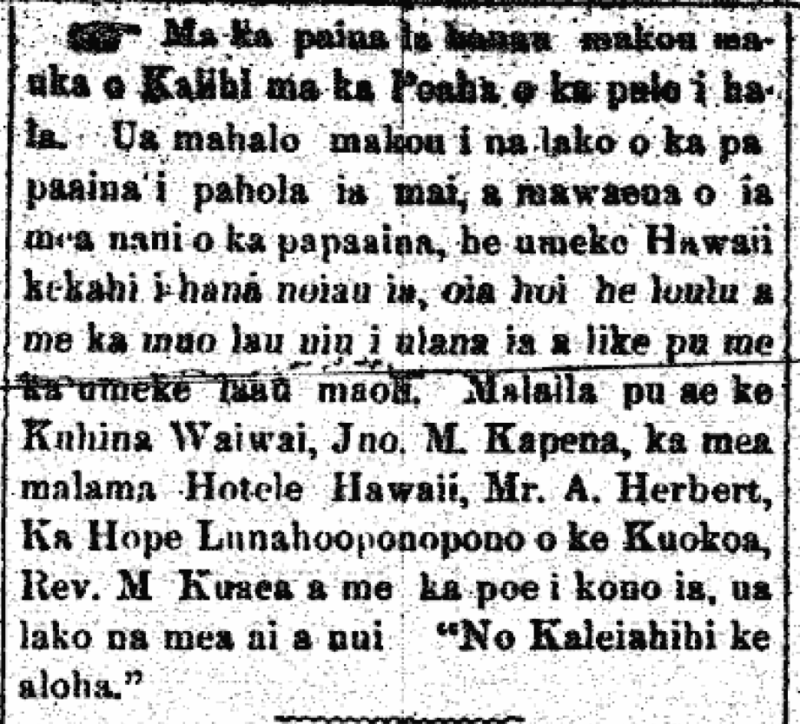 Kilipaki and lauhala hats in Honolulu, 1903. Art of Hat Making is Falling Into Decadence Among the Hawaiians and Was Chief Industry Among the South Sea Islanders. With the departure of the Gilbert Islanders for their South Sea home in the British S. S. Isleworth, the art of native hat making is likely to fall into decadence. Strange as it may seem the majority of the native hats sold in Honolulu for many years past have been made by the Lewalewas who in turn were taught the art by the Hawaiians. Form the Island of Hawaii come the more expensive native hats, and the departure of the Gilbert Islanders will undoubtedly give an impetus to the art in Kona and Kohala. In and around Honolulu there are but few Hawaiians who have the deft art at their fingers ends, and except among the older generations of natives, little about hat making is known. As with hat weaving, so with the making of mats. An old native woman at Waikiki is one of the few who can repair mats, and another in Manoa valley still manufactures mats, large and small. The present generation of Hawaiians has not added hat and mat weaving to its accomplishments. A couple of years ago the Gilbert Islanders has a village on the naval reservation on the Waikiki side of the harbor channel. Camera fiends and brush artists found the village a picturesque attraction, where nearly all the women villagers manufactured the cheaper grade of hats which were sold here for $1 and $1.50. 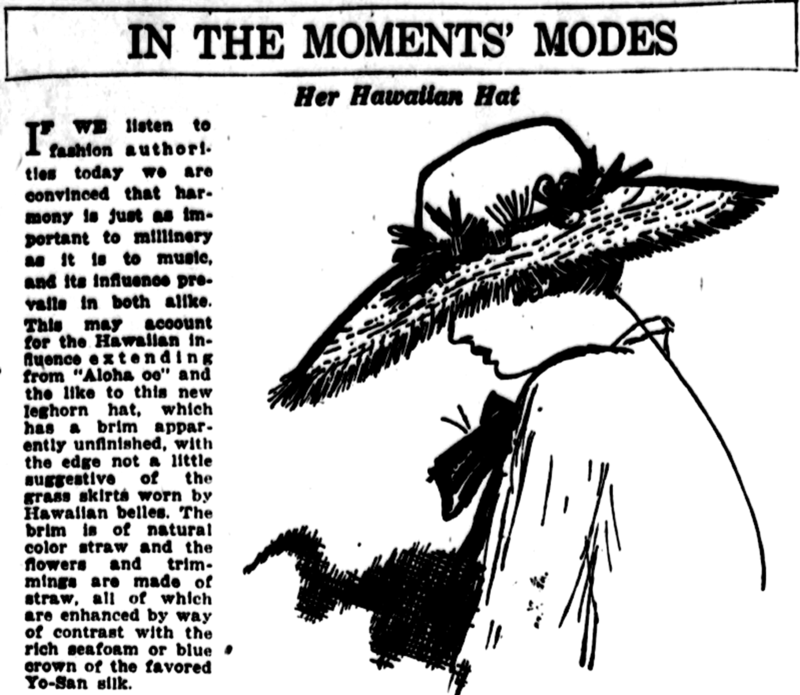 Revival of the lauhala hat, 1919. When the Hilo Ad Club visited Honolulu in Territorial Fair week, they all wore lauhala hats, which a few years ago were worn almost exclusively by Hawaii’s male citizens. Following up this re-introduction of the native woven Hawaiian headgear, J. Walter Doyle, who had charge of the publicity for the Fair, appeared on Honolulu’s streets with a widebrimmed papale, adorned with a pugaree. Not a 15 years or more has the native-made lauhala hat been in the honored position as a part of the sartorial adornment of Honolulu’s men about town, but up to that time it held its own steadily against the encroachment of the straw sailor from Philadelphia and Troy and Camden, running a good second to the jaunty and serviceable Panama, then purchaseable at a reasonable price. The increased duties on the real Panama have served to make the Panama a luxury as a part of men’s dress, while the lauhala, not fashionable enough to go with custom made serges and the creations of Broadway and State street finally went into the discard, despite its cool and shady qualities. The Maui News, Twentieth Year, Number 1007, Page 1. July 4, 1919. The San Francisco Call, Volume LXXXIX, Number 114, Page 32, March 24, 1901. Hawaiian influence in music and fashion, 1917. IF WE listen to fashion authorities today we are convinced that harmony is just important to millinery as it is to music, and its influence prevails in both alike. This may account for the Hawaiian influence extending from “Aloha oe” and the like to this new leghorn hat, which has a brim apparently unfinished, with the edge not a little suggestive of the grass skirts worn by Hawaiian belles. The brim is of natural color straw and the flowers and trimmings are made of straw, all of which are enhanced by way of contrast with the rich seafoam or blue crown of the favored Yo-San silk. Evening Ledger, Volume III, Number 174, Page 12. April 5, 1917.